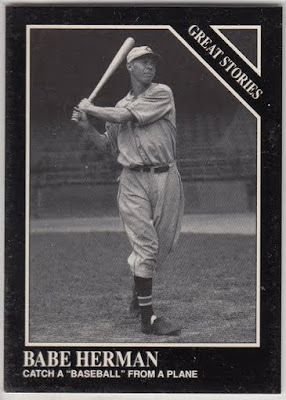 Here is todays Daily Conlon card numbered #169 featuring former Dodger Babe Herman. He tells of a story concerning long-time Dodger manager Wilbert Robinson- affectionately known as Uncle Robbie. A female aviator, Ruth Law, was making daily flights in the area, dropping golf balls as a publicity gimmick for a local golf course, and eventually the talk in camp turned to the idea of catching a baseball dropped from the plane. Though none of his players was brave enough to try, Robinson, three months shy of his 53rd birthday, agreed to accept the challenge. On the big day, Law forgot the baseball back in her hotel room so she substituted a grapefruit from the lunch of one of her ground crew at the last minute. 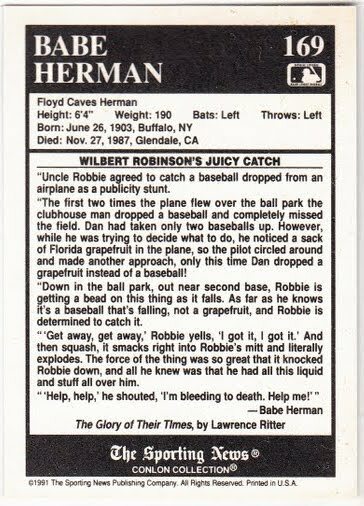 The grapefruit landed in Robinson's mitt and exploded, knocking him down and drenching him in warm juice. Thinking he was covered in his own blood, Robbie called for help. The players rushed over and began laughing uproariously when they realized what had happened. 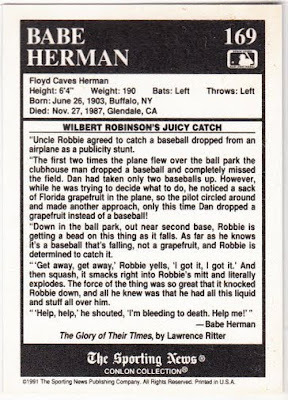 Robinson always suspected that Casey Stengel or trainer Fred Kelly had played a prank on him, and Casey later claimed that he had been the one to drop the grapefruit, but Law herself told the true story in a 1957 interview. I would have loved to see Tommy do this. 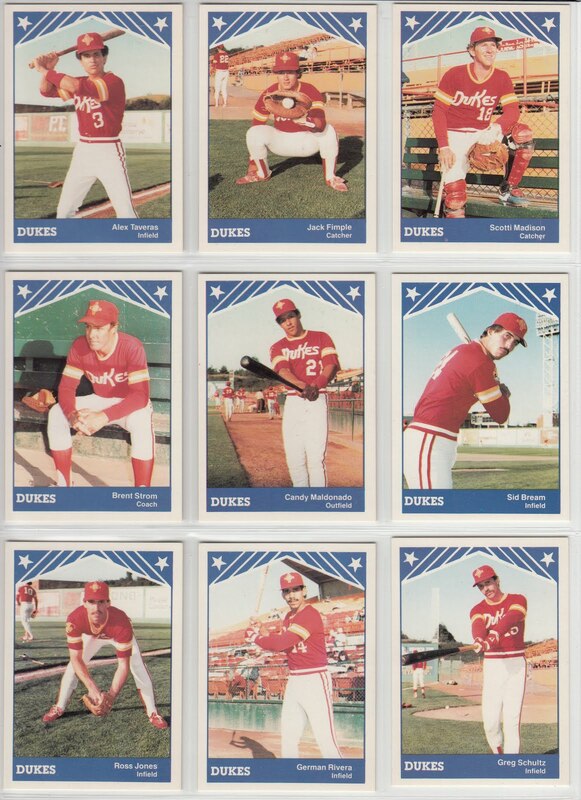 With the Murdoch mess happening across the Atlantic, I figured that, sooner or later, some strange dirt would pop up concerning his former ownership of the Dodgers. It was just bound to happen. With that, we have a commentary made by uber-liberal Keith Olberman regarding his time as a Fox Sports broadcaster and the circumstances surrounding his ouster. Apparently, he had reported (w/o Murdock approval, but with approval from other corners) that News Corp./Fox was looking to sell the Dodgers. For that, Murdoch had Olberman personally fired. Anyway, I thought that was interesting and worthy enough to post here. Check out the video below. A big thanks to "Let's Go Dodgers" blog for pointing this little record out. 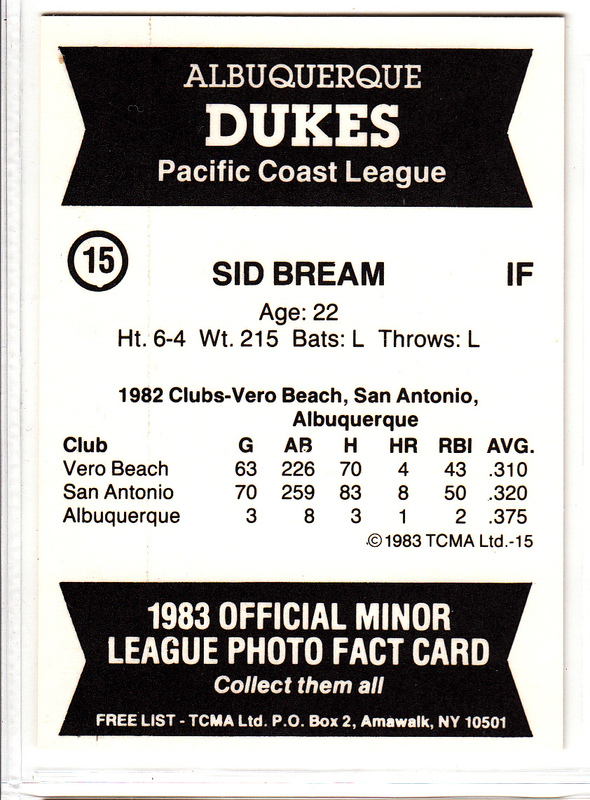 He links to "Big Hair and Plastic Grass" who highlights a record made by Ron Cey that could have jump started a new career for our third baseman. LOL! OK, who are we kidding. Anyway, click through here to hear a recording of the A and B sides to the record. It's a must listen. The best part about doing some brief research on this record is this story from the "Penetrating Moments" blog. 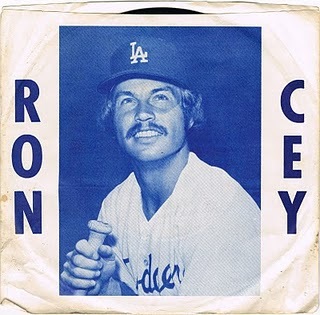 Most of the time the guys would sign pictures, baseballs, baseball cards, etc….so imagine my youthful glee as I stepped up to the table to meet Ron Cey only to discover he was selling a homemade 7″ single he’d recorded featuring two country-tinged pop songs, “Third Base Bag” and “One Game at a Time”. I really don’t know what Cey was thinking, but obviously somebody convinced him it was a good idea. I guess everyone wanted to be a rock star. 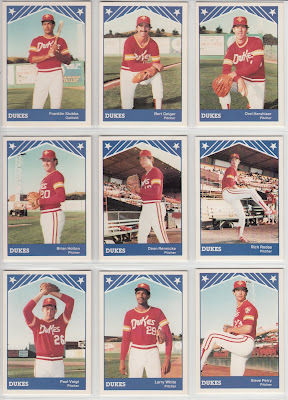 Here is another great vintage Dodger minor league set from my collection. 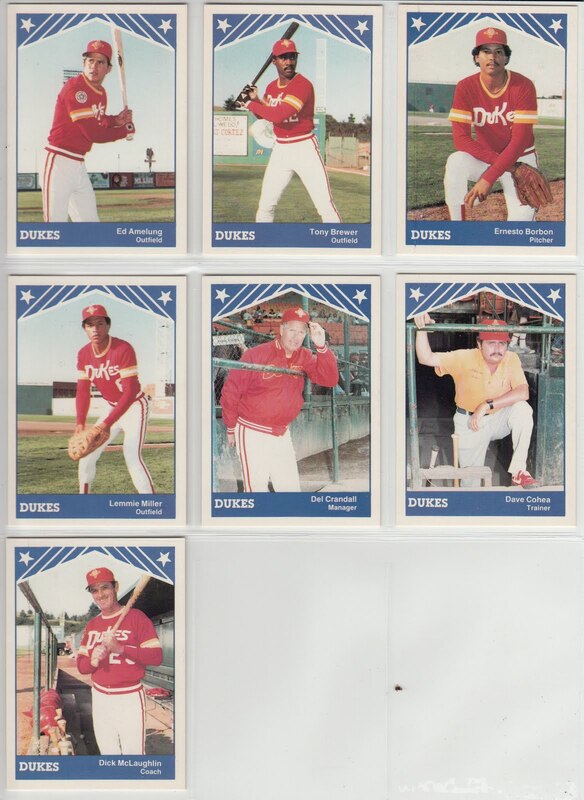 It is of the 1983 Albuquerque Dukes and it is filled with a whole bunch of future Major Leaguers. 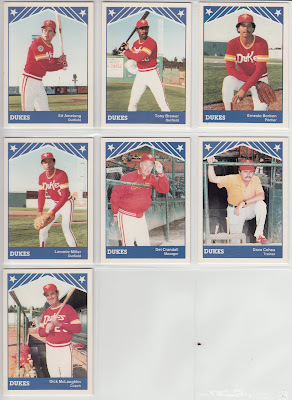 Above you can see Jack Fimple, Candy Maldonado, Sid Bream and German Rivera. 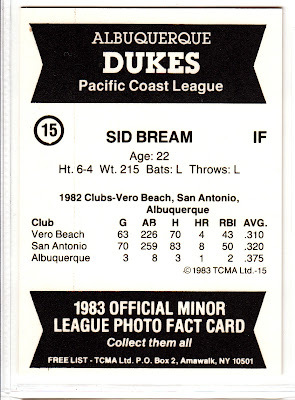 Below is the back of Sid Bream's card. 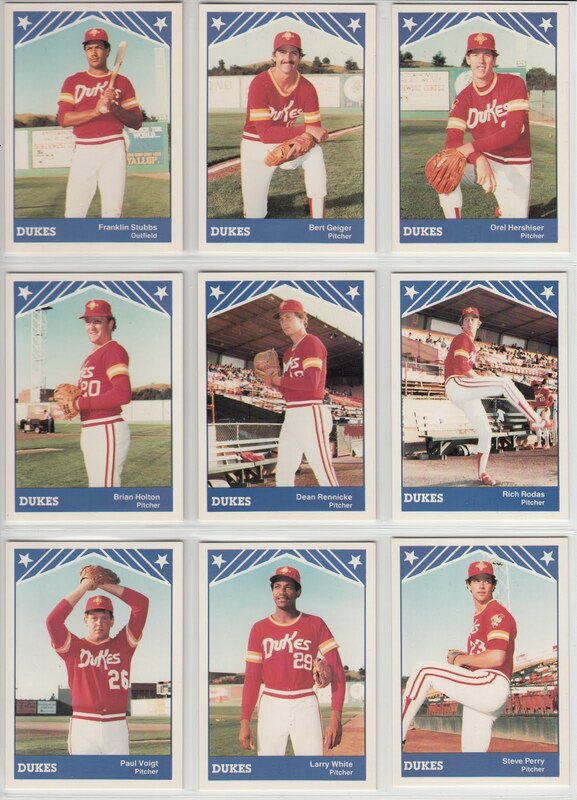 Soon to be Major Leaguers below include Franklin Stubbs, Orel Hershiser and Brian Holton.